#MushCrushMonday: Jimmy Garoppolo – Expanding your culture, one touch at a time. 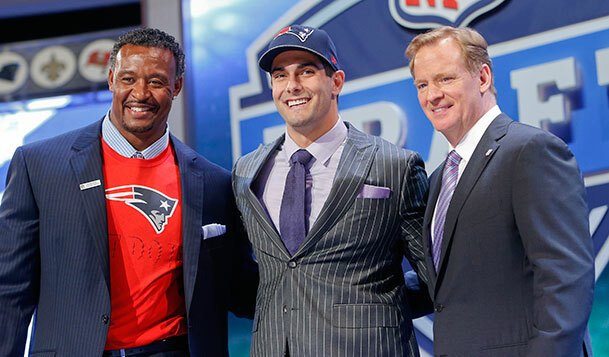 The Patriots have drafted a mush Quarterback. Jimmy Garoppolo mush went to Eastern Illinois, the same school as Tony Romo. He was asked if his last name was Greek and he replied saying, “Italian, it ends in a vowel.” This mush has a great set up for pleys going into this football season. He gets to say he is the greatest QB of all time’s backup. Meaning he gets to eat all the burgahs that Brady (a faithful husband) rejects. Mallet is way too big of a geach to get as much left overs as Garoppolo. Jimmy mush is going to learn a lot from the best QB of all time, Tom Brady and the best backup QB, Ryan Mallet. He scored a 24 out of 50 on the Wonderlic test, which tests football knowledge. It is a written test just like the Finals we have been taking the past couple of weeks. Much better than Carlos Hyde’s alleged 9 out of 50. After one year under Brady and Mallet, he will be much smarter. Combining the knowedge he will gain and the QB skills he already has, this mush could be something big for the New England Patriots. Hopefully we build this mush into a legend. Maybe one day young Italian men will be able to say, “Hey, one day I can be an NFL QB, Garoppolo did it.” Congrats on being drafted Jimmy mush.